For many coffee lovers, functioning properly without their morning cup of Joe is too tall an order. Brewing coffeein the morning can feel like an art for some, but for others it’s a way of life. So, for your home-brewed cup, Indianapolis is home to a number of roasters who have taken years perfecting their craft and creating their own distinct flavor. The result is a plethora of options for the most eye-opening beans, each with their own unique mixture of delicate aromas and taste. You don’t have to look far to get a taste of the world’s finest coffee beans. These roasters use only the ripest and highest quality beans from all around the globe to create their specialty roasts and blends. So if you’re looking for great morning coffee or just a pick-me-up to get you through the day, pop by one of these coffee roasters and grab a cup. If you’re looking for an organic twist in your morning cup of coffee, then Calvin Fletcher’s Coffee Company is the place to go to. Calvin Fletcher’s uses beans that have been roasted just shy of dark which, according to them, is the point when coffee packs the biggest flavor punch. The coffee company sources its roasted beans from Jameson Coffee but Calvin Fletcher’s has plans to expand and roast their own coffee after being voted “Best Coffee Shop” by Indianapolis’ Metromix. Beyond the cup, Calvin Fletcher's offers pastries and sandwiches all served by friendly staff in a fresh art-infused environment. The topper on the (coffee) cake is that not to Calvin Fletcher’s is a non-profit organization, which goes well with their organic blends and fair trade beans. The company believes in not only serving people the best coffee, but also building communities and relationships. The Harvest Café Coffee Company serves some of the finest and freshest roasted coffees in Indianapolis. Its roastmaster brings in green coffee beans from all over the world to make the perfect mixture when small-batch roasting them. Each and every roast has a distinct flavor and aroma that they believe can please even the most discerning of palates. Whether buying a cup in the café itself or buying a bag of their premium roast, your coffee is of the higheststandard. They also provide educational materials and information as well as conduct programs on how to better enjoy your cup every time. Bee Coffee roasters is a small local company that has made an art of roasting coffee beans. The company understands that each and every roast has an ideal brewing method, and they continually experiment with different styles, strengths, and mixtures to make sure that each and every cup made using their roast is truly an experience. Using the small batch method of roasting, Bee Coffee roasters firmly believe that you can never fully understand how to perfectly roast coffee beans or make the perfect cup of coffee; rather it is a continual learning process and each successive cup of coffee is better than the last. So the next time you’re feeling low on caffeine or just want that extra kick, visit Indy’s local coffee shops. 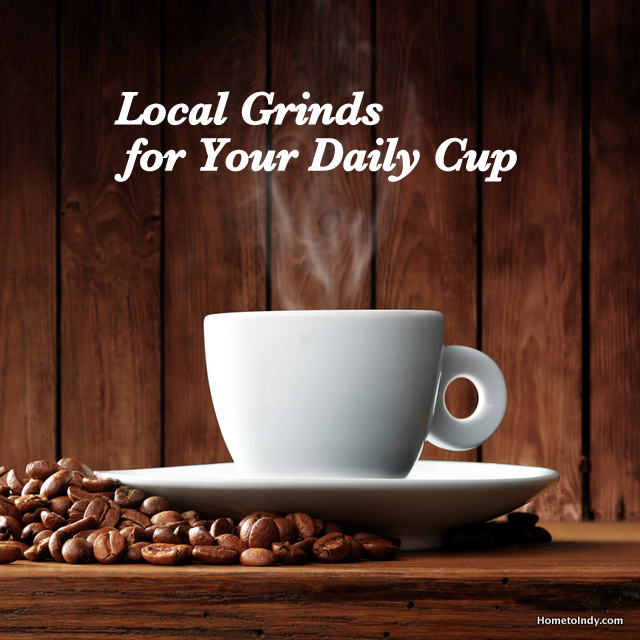 You’llget unique blends and aromas, all while supporting local Circle City Businesses.